A Natural and Gentle Remedy For Unwanted Intestinal "Guests"
A broad-spectrum herbal gastro-intestinal cleanse formula for internal parasites, worms and other harmful micro-organisms. It contains 12 traditionally-used herbs and concentrated foods to support digestive tract health in an easy-to-take capsule form. 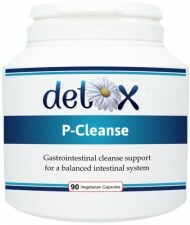 Used by naturopaths, colon hydrotherapists and herbalists as part of cleansing programs. as a travel companion or for those who have returned from a trip abroad where food hygiene and/or water quality are less then ideal. Allergy advice: contains milk or milk products including lactose (from the magnesium caprylate). Not advisable for people taking warfarin or those with a citrus allergy (contains grapefruit seed extract). Contains no: excipients, gluten, wheat, added sugar, additives, artificial colourings or yeast. 1 - 2 capsules, 1 - 3 times per day with food or as required. Ideally taken in 3 month cycles with a break in-between.